Well, I finally graduated from my Masters program in Education, via CTER at the University of Illinois, Urbana-Champaign. Forever an Illini now! 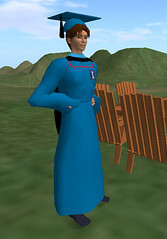 I was a little disappointed that I couldn’t make it into Illinois for my real-life graduation, but I decided to get dressed up anyway in OpenSim to celebrate. In a fit of curiosity I took my twitter feed (using Tweetdumpr) and exported all my twitter feeds into a text file. That’s about 1060 updates and I had joined a little over two years ago in May 2007. I thought it would be a great waste of time to take all of my twitter updates and string them together in a narrative style, taking out all the RT and @replies to protect the innocent but leaving content and links intact. What you get…well…is a lot different from my typical blog entries I guess. What began as a nice little bit of introspection turned out to be more disturbing and funny than I thought. So here are some excerpts if you care to read, I picked the funnier ones out here. Not that I am under any impression that anyone will find this interesting, but after graduating, I am in a bit of a “looking back and forward” sort of mood. New class, last one then it’s a full fledged Masters. It took two years, I remember blogging from airports, doing homework in movie theaters, mobility isn’t necessarily a great thing all the time. My latest class has me in OpenSim a lot. It is a great opportunity to use this software since it is essentially a private, open source VLE. It looks and behaves mostly like Second Life since it uses the same viewer application. But there’s lots of land to play in. One of our assignments was to create a movie in a virtual environment we’ve covered in class, and I decided to make a presentation showing the capabilities of the software. So here it is, after the break. We added a new member to the family, Madam Tiki. We thought Speedy our cat was getting a little bit lonely. So we went to The Pasadena Humane Society shelter and looked around and this little girl was sitting in a tattered little sweater being all quiet. I am not a small dog type of guy…but this one was cool. 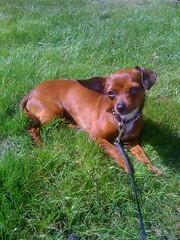 We figure that she is a Chiweenie: a Chihuahua and Dachshund cross, and some Dachshund-owning friends agree. She’s basically a long, dark red-colored Chihuahua. We thought score, but there must be a long waitlist, but it turns out that she was brought in that day. A week later, she came home…Speedy was a little curious but no disasters yet. I have been playing with a new tool to create interactive fiction games. I was a big D&D fan, and played the Zork games and even the excellent Hitchhiker’s Guide Infocom game. This was about 25 years ago when my parents had to wrench me off the computer to keep me away from those dark rooms with lanterns and rusty birdcages in the corner. I have fond memories of those days (I was 10 or so-ish) but more visual media has pulled me into the career I have now. That is, until my grad school program pulled me back. There is this really great tool out there called Inform that lets you generate interactive fiction games such as the ones I described above, all without too much drama coding it. The code is very legible, no crazy variables or other things to worry to create a simple game. Read on for a sample, and my first game! I had been meaning to throw up another update here but everything recently has been, as per my done-to-death saying, “all school-work and work-school.” I just finished my second to last graduate course in the CTER program at UIUC, Analysis of Advanced Instructional Technologies. If you are interested, the final report is a pbWiki page and we posted our final project preso on Slide.com. We discussed the future of education. Our group tried to tackle the question from a developmental/occupational point of view, from K through higher ed. Comments are welcome. Diana and I lost a good friend of ours over the summer. I haven’t been able to really process it yet. Don was a great friend and a great guy who had so much strength…. 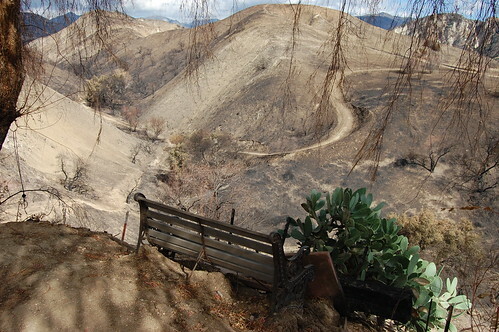 This is a picture of the bench behind Jan and Don’s old home in Kagel Canyon after the big fire in November. Jan came back into town and we checked out the property together. The fire raged all over the place, cooking their back yard, all except for the bench at which he had spent a lot of time looking out over the canyon. I logged some bench time with him there too. That’s it I guess…if I can grasp any metaphor to attempt to encompass everything that has happened recently, I guess it would be this one. I just would like to sit at that bench again someday. Found this on Educause Review via Alan Levine’s blog (daily reading for me). It really is an excellent piece on how storytelling can evolve using web 2.0 technologies out there. I just posted the entry below, so I will link it up and let the experts speak for themselves. 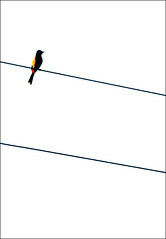 Check it out: Web 2.0 Storytelling: Emergence of a New Genre by Bryan Alexander and Alan Levine.